It’s been a few weeks since my last post and I thought, given that I have a choice (being a rainy day) between blogging and going to the garden centres to spend on beautiful things, I thought it might be a good idea to start by posting…and then if there’s time go to the garden centres! The lilacs are beginning to open their leaves with a fresh, lime coloured felt that soars up twelve feet. I’m really pumped because I’ve always loved lilacs, and these apparently are going to open up to a very old deep purple variety. You can see the progress the boys are making on the house, and it’s an interesting experience sharing the lot with them as they hammer away. Last week David and I helped them install the picture window, which seemed like it would be daunting at first, but ended up not being so tough given our new neighbour came over with advice and a can of beer. While Jarred and Dave tear the house apart, I tear up the lawn. Two new flower beds have gone in, both double dug, one got ahold of the delphinium which is poking it’s head out now, the russian sage I’m not 100% sure about (it always came late here at Gladder, I’m hoping it’s just thinking about it’s options at this point, two packets of poppies, a packet of wild flowers around the Marian corner, and an entire white envelope of hollyhock seeds which are refusing to germinate. I think the soil, because it’s in direct sun, is going to be too hot for them to sprout. Good thing I dug up five or six plants and brought them over. I think I’m probably going to dig up another five or six of the big roots and take them over. The mature leaves wilt, but new leaves quickly sprout up and start to soak up the sun. I need to dig another couple of beds for the tomatoes. There are going to be a lot of tomatoes. I think I’m going to be making friends with people through tomatoes. One old guy at the condo I clean gave me eight plants in white styrofoam cups that are supposed to grow up to nine feet tall and produce tomatoes like little grapes. Good thing I’m getting good at digging up turf. 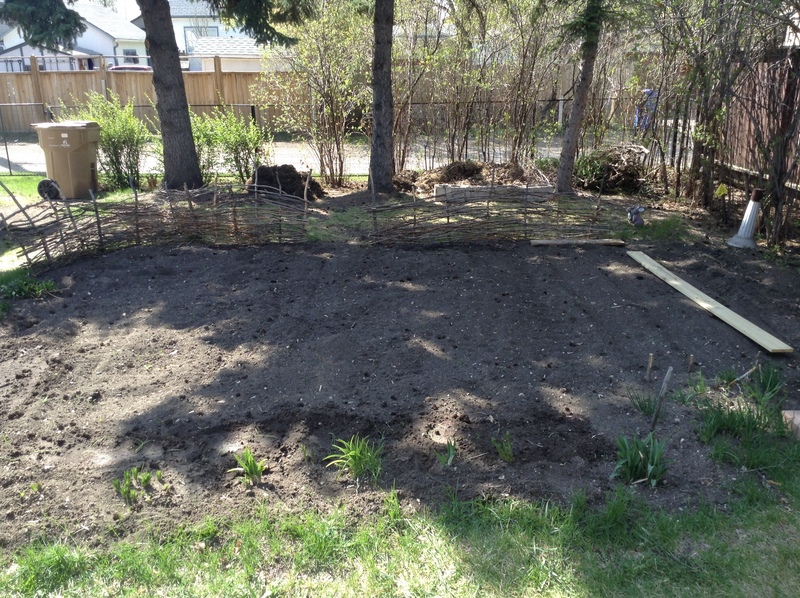 Onions are starting to poke their heads up, but nothing from the potatoes yet. Garlic? I see one little sprout poking it’s head up. The compost pile is starting to steam when I turn it…or that might just be dust kicking up, either way it’s breaking down and will be good food for the dirt come frost in September/October. I also put in a package of an ancient barley from the British Isles, a grain that very probably my ancestors were harvesting in their kilts. The lilies are filling in, and the perennials that I moved into the border are also waking up and taking to their new spaces. I realized as I was putting in the welsh onions (that little dark line just up top of the lilies, above photo) that the cottage garden thing is shaping up but confining itself to the veg patch. It’s not a bad thing! The space in the back waddle has got a path of some kind needing to come out of it, and the oodles of perennials I’ve got can make dividing spaces in the garden itself. I’m beginning to see that the room is running out. Dad said he wants to put in cucumbers, and I may have to sacrifice the zucchini so he can have a patch for them, and I’m not even beginning to have a clue where the peas and beans are going to go, but I have to get out to the valley in short order and cut lots of red willow to build the trellises for both of them, not to mention the sweet peas. The next nice day we get (probably Friday) will be seeding the carrots and the radishes. The seed packets on my desk are getting fewer and fewer. Dave and Jarred mentioned to me that it might be a better position for the pond beside the garage between the garden and the garage. This way, the pond will get plenty of morning sun and shade in the late day, with a little evening sunshine and less of a chance at becoming a festering pool of algae. I had to actually think about this, not about the common sense position of it all, but realizing that it may not be this year that the pond goes in. 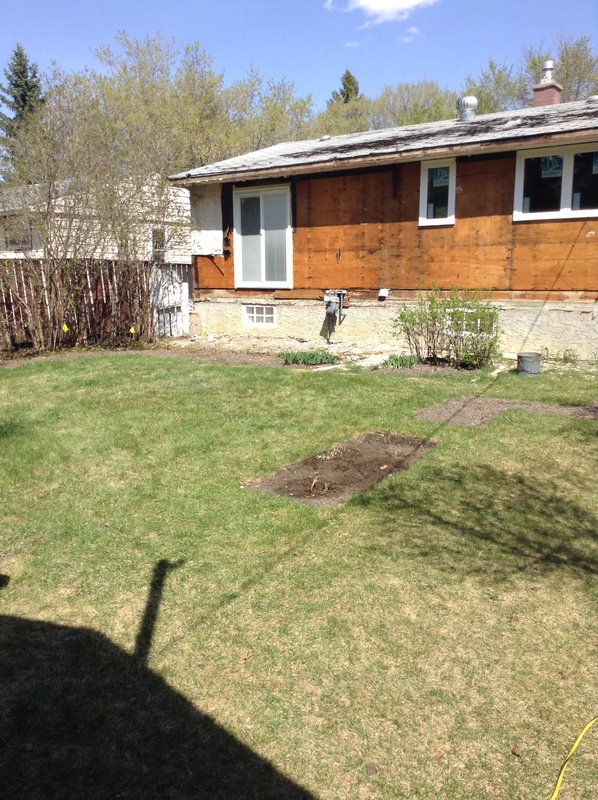 My goal was to get a shovel, and the liners, dig the hole, get the pond done and ready for the May long week-end. The only problem being that the outside of the garage is going to need to be fixed up and having a pond there might in fact be detrimental for anyone backing up while they’re taking off or putting on siding, or the life that may be living in the pond itself! I’m smelling a later summer/early fall project. Digging it by hand will be a lot harder than having someone do it with a backhoe; but I’m digging that the extra work that is going in is man-powered, me-powered. Then again, when the back hoe shows up I might just take advantage of Chad’s good nature and let him dig the damn pond. Even with all the noise, the dogs next door, the guys in the house, I spend a few minutes tucked in a corner just soaking it up and the nosies and everything just…disappear. I think if I could live in that yard I probably would. Having the deck off my bedroom with big sliding doors I can look out of when I wake up in the morning, looking into that space first thing every day before I even get out of bed…..what a way to live. What a great way to live.